The FVS Track and Field team travelled to Milton Keynes on Wednesday and enjoyed perfect conditions for the penultimate league meeting in the Eastern Masters competition. Despite missing some key team members, the ladies finished in second place, just four points behind the league leaders Marshall Milton Keynes. 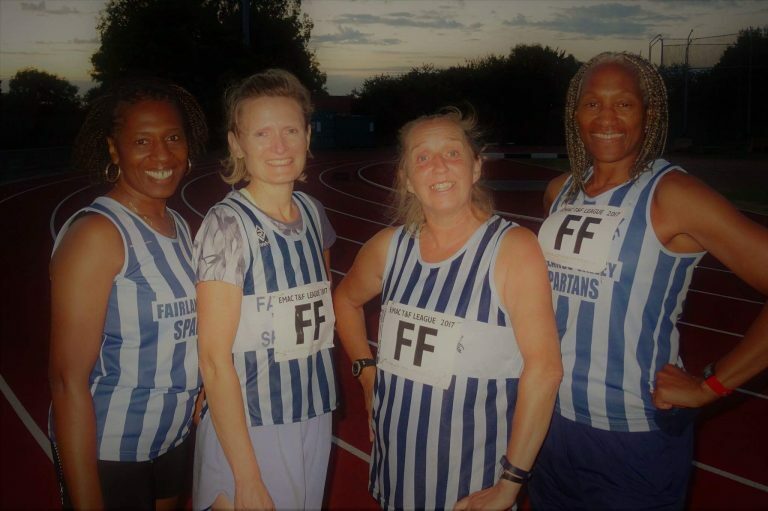 The women 50 plus 4×400 metres relay team of Tessa Stephenson, Sharon Crowley, Alison Wood and Monica Brown easily saw off the opposition and beat their own league record by nearly 10 seconds. There were also individual wins for Monica Brown, Tessa Stephenson, and Alison Wood on a busy evening that saw Iris Hornsey cover the W60 200m, 800m, hammer throw and long jump events! Iris treated herself to a well earned bag of crisps at the end. Christine Lathwell (1M walk), Andrea Westcott (400mH and 800m), and Peta Wilson (200m) completed the line-up for the ladies. The men finished in fifth place as the six man team struggled to fill places in some of the events. After an arduous 2.5 hour journey to the stadium, Steve Mayfield competed in the long jump, pole vault and ran a leg of the 4x400m relay. Anton MCalla went straight from finishing the 200m to the long jump, having already competed in the shot put and finished off the evening with a leg of the 4x400m relay! Mark Freeman (800m and shot put), John Harris (800m, 1M walk and relay), James Kilroy (800m and relay), and Dave Stephenson (200m, hammer throw and shot put) completed the line-up for the men. The final league meeting will be at Ridlins Stadium on Wednesday 28th July. Events start at 7pm. Supporters will be very welcome. Winner on the night in a new PB time of 25:50 was Joanne Bowdery, with Tim Robinson first man to finish, in a year best (YB) time of 23:23. Adrian Busolini was second man in a YB time of 21:27 and the returning Rob King 3rd man in a season best (SB) time of 26:20, narrowly ahead of Karl Shreeve’s 25:52 PB. 2nd lady on the night was Victoria Brett in 26:53, just pipping Abigail Pez on the line as improved her PB by 55 seconds to 26:57. Fastest runner on the evening was Richard Springall with 18:58, ahead of newcomer Johny Penell 2nd quickest with 19:26 and Mark Collins 3rd fastest in a new PB of 19:44. Fastest female was Hannah Neale in 23:04, with Julie Simmons 2nd quickest in 25:04 and Joanne Bowdery’s winning time was third quickest. There was also PB’s for newcomer Joe Malloy, last month’s winner Linda Nolan and new member Michael Andrews; a SB for the returning Adrian Donnelly; YB’s for Peter Smith, Rob Shaw and Theresa Keast, while Ryan Dunning beat last month’s time by 8 seconds. In handicap races runners are set off, slowest first, at times based on recent performances. If everyone runs to form they would, in theory, all finish together. In this race 79% of finishers were within one minute of their handicap time. 10 MARK COLLINS 19:44 Third fastest runner. PB (0:31). 27 HANNAH NEALE 23:04 Fastest woman. Eight Spartans made the short trip to Ware for the Ware 10 miles and 10K events, hosted by Ware Joggers. In the ten miles, in very tough warm conditions, Steve Green was first Spartan home in a super impressive personal best (PB) time of 68:40. Kerstin Weiner continued her very consistent 2017 form with a 93:38 time, to be first FVS woman home. She ran at marathon pace as part of preparation for the Berlin marathon in September. The 10 mile course was two laps between Ware and Hertford over a mixture of road, trails and a canal path, including two challenging hills before winding down a path onto Hartham Common. Nick Witcombe was the FVS solo entrant in the Ware 10K. He ran in the same conditions over a one lap version of the course. He finished in 01:06:39. Saturday Carol Paul completed her 350th marathon/ultra at the Ranscombe Challenge near Rochester in Kent. On an off road hilly course Carol completed 30.8 miles in 5 hours 55 hours 50 seconds. Now we can see one of the ways Fairlands Valley Spartans won promotion to the premier division of the Mid Week League – numbers. 120 different Spartans, 51 women and 69 men ran in at least one of the four races. None of the other five clubs had even 100 participants. In the Southern Track and Field League, Grant Ramsay won the 3000 metres steeplechase in Luton. Ramsay was only going to use the race as a training run, following a ten day injury lay off, but after feeling good earlier on, he kicked on to win it in 11 minutes 12 seconds. In a large field of 288, THOMAS SAUKA was the first Spartan home at Steveange parkrun, finishing 20th in 21 mins 31 secs. MARK BEASLEY was next in 22:50 with MARTIN DUDLEY third Spartan in 22:53. RYAN DUNNING continues to be in consistent form, completing in 23:40 with TIM ROBINSON next in 24:11. The remaining men running were DANIEL SUTTON (25:11), JON SYPULA (25:55), MICHAEL ANDREWS (26:13, a new course PB), SIMON SYPULA (26:27), KEN JUDE (27:50), JAMES SOUTH (30:25), STEVE GREEN (30:34) and ANTHONY OSBORNE (38:22). VERITY FISHER was second woman to finish, crossing the line in 23:19. TRACY PEZ was next, finishing 6th in 24:09 as if to shout “I’m back!” and RUTH REILLY just squeezed in to the top thirty in 27:46. BEVERLEY HARLOW (30:56), SALLY PHILLIPS (31:01) and KELLY CHAPMAN (37:24) were the other Spartan women. Elsewhere, DARRYL STEVENS left his south-coast parkruns behind to run at Panshanger, finishing in 41:59, while at Ellenbrook Filelds BARRY OSBORNE was 33rd male in 23:11 and KAREN PALMER was 15th woman in 27:14. While Darryl was in land for a change, other Spartans WERE on the south coast. NEIL ROBINSON completed Bognor Regis parkrun in 25:22 and EMMA MARTIN ran at Hastings in 37:22.